The Amish Handcrafted Gingerbread Cottage Playhouse creates the ultimate play zone for your kids. 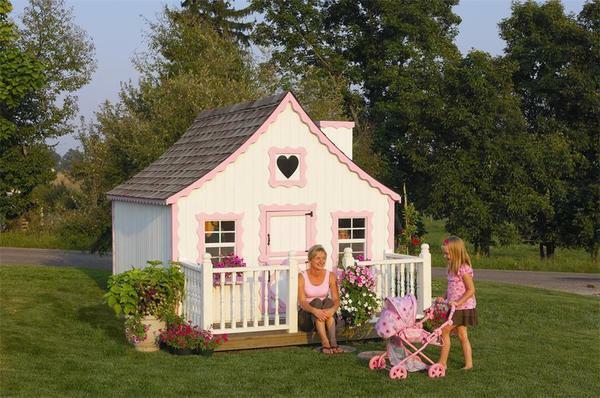 This child sized cottage is a great way to encourage your kids to use their imagination and make the cottage whatever type of house they want. From a normal house to a fire station, a restaurant, or a cabin in the mountains, the possibilities are endless! It is sure to keep the kids occupied for hours and even adds style to the backyard. Add a chimney and shutters to the playhouse to make it feel even more like an actual home! No matter what customizations are made, the Amish Handcrafted Gingerbread Cottage Playhouse is sure to create lasting memories for your children and family. Gingerbread Playhouse kits are roughly 8’ high and come in three sizes. Not what you are looking for? Take a look at the other playhouses we have to offer! If you have any questions, do not hesitate to call and speak with one of our friendly Amish Furniture Specialists toll-free at: 1 (866) 272-6773.